"Set... focus... Strike!" A samurai of Rokugan who does not thrill to these words is no samurai at all, and would do well to abandon his swords by the side of the road. Dueling captures many important facets of a samurai's life: skill with a blade, moral and physical courage, personal honour and loyalty to family and clan. It is an experience which compresses his existence to its essence... his entire being summed up in a single instant of perfect action. But dueling is not limited to the warrior ranks alone. Shugenja have used the rites of taryu-jiai to settle matters of honour between them almost since the dawn of the Empire. Courtiers have a myriad of less violent (but no less dangerous) methods of dealing with rivals for personal and political ends. * A comprehensive survey of rokugani traditions of dueling and personal competition, as practiced by each Great Clan, the Imperial Families, the Minor Clans and even the samurai of The Lost. * Apendices describing the legendary Test of the Emerald Champion tournament and the Test of the Minor Clans tournament, and how to incorporate them into your camaign. Every Legend of the Five Rings Roleplaying Game campaign includes moments when the material in these pages prove invaluable, because as we all know, there is a time in every samurai's life when a challenge becomes personal. 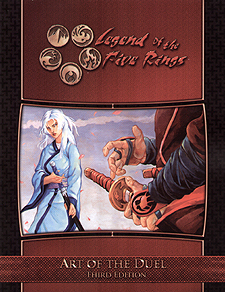 The Art of the Duel is a rules supplement and its use requires the Legend of the Five Rings Roleplaying Game Third Edition core rulebook.